Hi people, the benefits of running are being realized lately in India, as there appears to be almost a running revolution with quite an ecosystem developed in a short period of time! Just for perspectives, as per indiarunning.com, there were 20 running events on Dec 30, 2018 and 26 running events on Jan 6, 2019 respectively (single day). In fact, in the first three months of 2019, there are around 180 running events averaging 60 per month, 2 per day. Now that is phenomenal! Compare that with the single event SCMM back in 2004. Of course the sport was there in schools, colleges, universities etc. but very few people ran except the ones pursuing a career and or job in army or PSUs. Show us Indians value in something and we millions will turn it into a revolution with our creativity (as we can see on the social media as well- power of numbers). Thus we have various themed races. Run for deaf, blind, girl child, nirbhay, indian army, air force, navy, challenge plastics, for pride, run to feed, polite-o-thon, green-a-thon and of course pinkathon…i mean, on so varied theme with equal enthusiasm from the ladies as well. These days runs are organized in almost every hail and mountains of India, including the highs of Leh n Ladakh. As one could see there is indeed a running revolution with thousands taking the plunge every year. Running is now an year round activity in india and there are close to 500 events organized in an year, including during the summers and monsoons. Well, the participation level varies depending upon the popularity of the race, Mumbai Marathon being the most popular (around 45k) to events where few hundreds only participate. The gamut of events comprise 5k, 10k, 21.1 (half marathon), 42.2 (full marathon), anything beyond that is an ultramarathon. There are various ultra events of 50k, 75k, 100k, 111k, 100miles, 222k, 333k, intercity runs, various trail events including one in the desert (Run the Rann). These days obstacle and mud events are also organized. A good number of Indians run the international events like Comrades in Durban, Boston, New York, California, Berlin, London, Amsterdam, Tokyo, Dubai almost the world over. In fact this years’ 90km Comrades event, Indian contingent is the second largest international contingent out of Africa. Yes, that’s true! Thus, with so many events happening and so many people running, injuries are also happening thick and fast due to enthusiasm, ignorance and indiscipline, and people are being forced to take a break from this beautiful sport. Despite having such a long history of running, I did not take my plantar injury seriously. Firstly I had to train for the comrades and then those static exercises and stretching felt dead boring! And my plantar has not healed even after an year now. I have to waste an entire running season 2018-19! I had to let down the opportunity to pace the Adani marathon, Tata Mumbai marathon etc. I wanted to have a go at the Boston Qualification which has been delayed now. Thus it is very important to take the injuries in correct earnest and heal it. Accessories: A good shoe is very important. There are lots of options available in the market. Depending upon your budget, you could have different brands for different runs/ surfaces/ intensities. Try to make good research on this single aspect as this is most crucial. At times certain showrooms/shops also provide advise on the type of shoe depending upon your foot type. It is advisable to invest the maximum you can on shoes. And have alternatives as well. Get advise from the experienced runners/ your run buddies. Warm up: This is a very important aspect of any physical fitness regime. One needs to do a 5-10 minutes warm up and few minutes of cool down (Read here post run stretches) after the session as well. These could mean just jogging for few minutes and doing some dynamic and static stretches like hamstring stretch, side stretch, simple neck n shoulder stretch to activate the different muscle group so as not to injure during the exercise and benefit the most out of it. The same stretches could be repeated after the finish of the session. Techniques of running: While initially it may not be relevant, but as you progress more and more into running, learn the recommended body form while running , foot landing, arms swinging, proper breathing pattern (very important). Then vary your running surface if possible. Needless to say, you would run different distances/intensities in a week/ month depending upon your level and aim for the next race. You get the proper running form from the experienced runners/ your coach. Its useful if you are able to find a running group. That keeps you informed, motivated and helps you to continue your runs in an enjoyable manner. Cross Training: Running deploys various muscles of the body right from the upper body to the smallest toe joints. The core and the lower body are a very important part which takes the most of the load. However, calf muscles, knees are also important for the distance and intensity. Thus, it is imperative to strengthen the entire body. It is in this context that cross training can never be under emphasized. We need to develop overall body strength and flexibility through cycling, swimming, weight bearing exercises and of course the yoga (at what ever intensity you are comfortable with). All this cross exercises works upon different musles groups, joints and tendons thereby strengthening them. It makes them more flexible to take on additional load and absorbs additional pressure. Diet: Diet plays a central role in your fitness goal, whatever activity you wish to pursue. If you are trying to loose weight (Read here about running and weight loss), loose fat, become fitter, want to get that glaze on face, aim for your certain distance, certain time or just fitness. A healthy and mixed diet is extremely important. Include a variety of food items in your plate and eat at regular intervals. Eat at least 5-6 meals per day. Include more fruits, vegetable and nuts in your diet. Avoid/Limit junk food and fried food. Limit alcohol intake. The golden words are WATCH PORTION!!! (find your own golden method that works, but do it). In case you cant, carry tones of cucumber/watermelon with you! Needless to say runners need to be adequately hydrated on and off the field for optimum results. Discipline: Maintaining a disciplined life style is important, else you tend to loose the gains made on the field. Yes one has to socialize, but we should be always aware of the fact that we need to moderate on those and cut down on our cheating days. Most importantly don’t over eat and over booze. Maintaining a disciplined lifestyle not only helps in sports and running but also at our workplace and as well the society around us. Disciplined people are generally more successful in whatever venture they take up. Sleep: Sleep is a very vital cog in the fitness wheel. It heals the body and gives more gains than is lost during a training session. Never run on sleep deprived state unless extremely urgent, say for the actual events themselves. It might be difficult due to the work pressures, our travels and commutes. But proper sleep is non-negotiable. Make up for the deficit. Sleepless sessions are known to be fatal! Remember its the quality of the session which is important and not the quantity! Read here about basics of healthy living. Listen to the Body: And above all listen to your body. We have to realize that we all are different by our genes, musculo skeletal system, hereditary traits. We all have different muscle fibre types and heart rate etc which are essential traits of an athletes. It is often said that the best thing an athlete can do is to “choose his/her parents” . So our body will tell us whatever it needs and suits. We just need to be careful reading it. Thus we have to vary the intensity/ distance/ time to see how your body is reacting. Don’t run through pain. Take it seriously. There is the golden rule of not increasing the mileage by more than 10% per week. Similarly listen to the body how it reacts to food and other exercises and adjust accordingly. Give it proper nourishment and adequate rest. Injury management: Don’t take any signs on injury lightly. Depending upon the injury, Ice take medical advise asap. In the meantime ice it 10-15 mins at least twice a day, take rest, keep the affected area elevated if possible. So happy running in 2019 and wish all your running aims come true. Madan is a health, fitness and well being motivator with more than 26 years of experience in health and running activities. An alumunus of IIT Kharagpur 1996, and IIM Calcutta 2003, Madan is presently DGM of a PSU bank, Head, Risk.He started competitive running (college level) during 1992 at IIT Kharagpur. Went for the annual inter IIT meets at IIT Kanpur and IIT Madras. Had to take a gap of almost 10 yrs between 1996 to 2006 due to job n family, but mainly because there were no amateur running events. Resumed running since 2007 with Airtel Delhi half marathon. Had to take intermittent gaps during 2009-12 (due to injury). Regular since 2013. 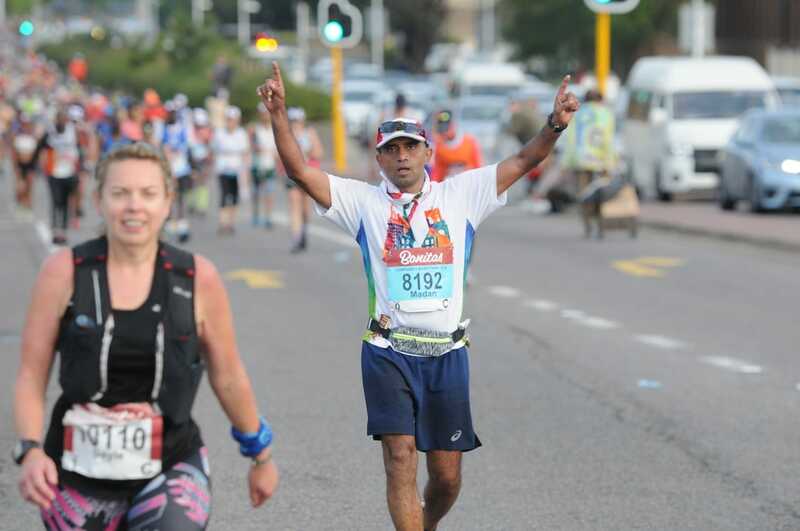 Participated in numerous half marathons and few full marathons since then and an Ultramarathon at Durban, South Africa.Personal best times42.2km: 3:32hrs in 2018; 21.1km: 1:35hrs in 2017; 5km: 17:54min in 1995.Apart from giving health talks in various organisations, he is into Yoga, gymming, swimming, playing guitar, singing, dancing, blogging.